Get high speed and long distance real time transmission with this 2.4 megapixel / 1080P HD-over-Coax vandalproof armor dome camera. In addition to being motorized varifocal, the HDCAD-1080-312 will see up to 98ft infrared and is analog / HD switchable. With true versatility, this HD-over-Coax camera can be paired with either an Analog DVR, HD-over-Coax DVR or Tribrid DVR. 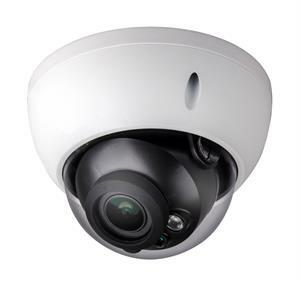 Use as part of an indoor or outdoor surveillance system. *If this camera is going be used in Analog mode, the camera must be switched before shipping or via a Test Monitor. **If the camera is in Analog mode, the zoom must be adjusted via a Test Monitor. There are no manual controls.